PriscoTech SolvKlene II Solvent Recycler Systems allow for easy and safe distillation and recycling of waste solvents used to clean and maintain printing presses. The systems are an ideal cost effective solution for dealing with the substantial amount of waste solvent generated by some new presses equipped with automatic blanket washing systems. 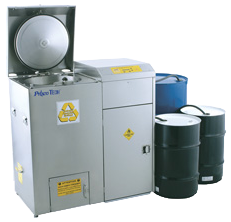 Solvent recycling, an off-press, self-contained process, effectively cleans used solvent by removing the absorbed over. The segregated distilled water, if present, is collected and disposed of in accordance with local regulations. The storing, handling and transporting of hazardous waste solvent hurts profits and can make compliance with environmental regulations problematic. Moreover, every gallon of hazardous waste solvent recycled is a gallon that does not need to be purchased, thereby reducing VOC emissions and improving profits. With SolvKlene II the solvent waste that must be transported from the plant is drastically cut. This may mean an improvement in the Hazardous Waste Generation classification of the plant and easier compliance with compliance with compliance with local environmental goals. 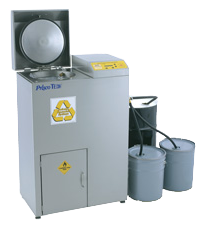 Hazardous waste solvents are an expensive problem; the PriscoTech SolvKlene II Solvent Recycler Systems are the economical answer. SolvKlene II Systems are offered in batch and continuous-feed models to meet the needs of almost any large and small printing plant. The PriscoTech SolvKlene II can reduce solvent waste transported off-site by up to 95%!